The Australian Services Roundtable (ASR) is proud to be representing Australian business views on reform of the multilateral rules-based trading system, through the International Chamber of Commerce (ICC) initiative of an ICC-WTO Global Dialogue on Trade. The Global Dialogue on Trade, a digital platform launched on October 10 by ICC Secretary-General John W.H. Denton AO and WTO Director-General Roberto Azevedo, will facilitate urgent debate and sharing of views on the multilateral rules-based trading system among businesses, governments, thinktanks and academics. ASR, the peak business body representing the services industries, is the only Australian business organisation participating in debates on the platform, which are moderated by the ICC and designed to culminate in recommendations to the WTO. “Concerted business messaging in support of open global trade and the rules-based order deserves priority attention,” ASR Chair Jane Drake-Brockman said. 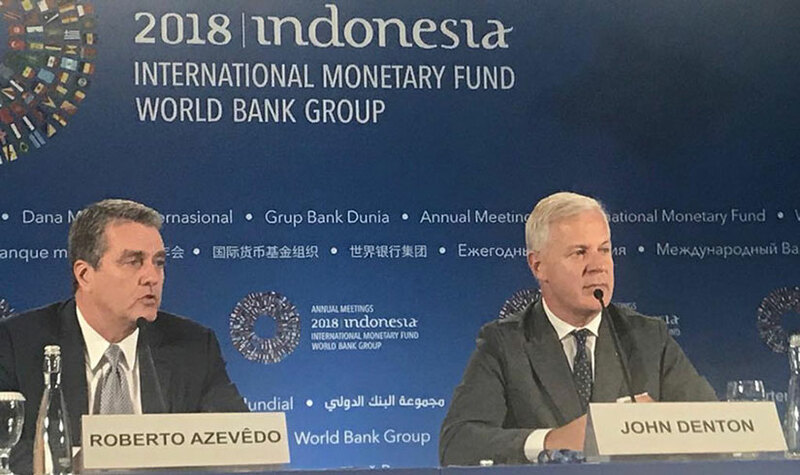 The Global Dialogue on Trade was launched in Bali during last week’s annual meetings of the IMF/World Bank, at which heads of the world’s monetary and trade organisations called for co-operation amid rising trade tensions. “The business community is at the forefront of international commerce and should contribute to shaping the rules that govern cross-border trade,” ICC Secretary-General John W.H. Denton AO said. ASR is taking part in initial discussions on the new platform in November. Sydney-based thinktank The Lowy Institute is also participating.